Image caption Exeter Airport's managing director Matt Roach said the move was a "significant vote of confidence"
Ryanair will run flights from Exeter Airport to three European destinations starting next year, the budget airline has announced. New routes to Malaga, Naples and Malta are expected to attract 80,000 customers per year, Ryanair said. The announcement makes the airport Ryanair's 21st base in the UK. 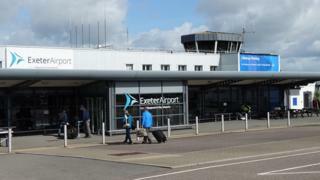 Exeter Airport's managing director Matt Roach described the announcement on Tuesday as a "significant vote of confidence". Passenger numbers at the airport have increased by 22% to more than 900,000 in the past five years. Mr Roach said: "These routes are popular destinations and offer customers even more choice and greater connectivity from their local airport."